Taking only half of a well-known phrase by way of a title, The Calm Before carries an implicit connotation of incompleteness, something unfinished, abridged. While there’s nothing remotely sketchy or half-formed about the six tracks on this album, their sparse, spare and elegant folk qualities do subscribe to a certain degree of minimalism. 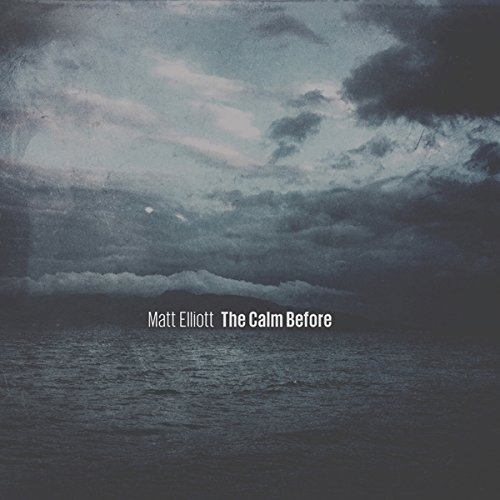 As Third Eye Foundation, Elliott singlehandedly redefined the parameters of drum ‘n’ bass, while his solo work is broadly categorised as dark folk. The Calm Before isn’t really so dark, and doesn’t have the same sombrenesss of, say, Drinking Songs. The simple acoustic instrumental piece, ‘A Beginning’, which appropriately introduces the album, has a lilting, lullaby quality, which drifts into the 14-minute title track. Elliott croons gently, quietly, calmly, the melody ascends and descends. Its simplicity is its strength, and the mood is at once uplifting and wistful. ‘I Only Wanted to Give You Everything’ finds Elliott in a darker place, a delicately picked guitar line reminiscent of early Leonard Cohen providing the backdrop to his Thom Yorke-like mumblings, before shuffling beats creep in and gradually swell while widescreen strings swoop in and build to a crescendo of abject rejection as he repeats ‘but you don’t love me…’ over and over. There’s a downtempo Latin flavour to ‘Wings & Crown’, which demonstrates almost rockist tendencies, before the final track, ‘The Allegory of the Cave’ offers some light at the end of the tunnel as soft ambient notes drift over distant beats and piano and acoustic guitar skip lightly towards hope. Matt Elliott – The Calm Before (teaser) from Ici D’Ailleurs… on Vimeo.